In the classrooms at school, when a group of students is working in a predetermined task, the teacher or the tutor identifies some problems related to collaboration by observing the students’ behavior. While interacting, people interchange messages composed of speech, actions and gestures, as the wordless messages emphasize, support or even substitute speech. In 3D collaborative virtual environments (CVE), the user’s graphical representation, an avatar, is the means to express this nonverbal communication (NVC). 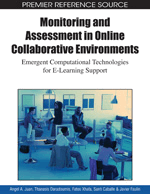 The authors’ proposal is that, like in a real learning scenario, by the observation of specific NVC cues, indicators of collaborative interaction can be inferred to an extent that they can be used to foster collaboration, if necessary, in a learning task situation. The various NVC cues that have been selected for that purpose and their corresponding collaborative learning interaction indicators will be presented. An exploratory study that consisted in the analysis of a real life situation during a collaborative task accomplishment, directed to the development of an experimental 3D CVE desktop application that allows avatars’ display of NVC cues, will be discussed. When people interact, speech and actions are intricately related to the position and dynamics of objects, other people, and ongoing activities in the environment (Ford, 1999). Messages go through multiple channels that involve more than speech, like body movements, gestures, facial expressions or actions; these wordless messages are nonverbal communication (NVC) (DeVito & Hecht, 1990). NVC is practical for learning scenarios in a number of forms, like being a means to present information in more than one modality, usually associated with learning, or by helping to understand the words that accompany (Goldin-Meadow, Wein, & Chang, 1992). The visual embodiment of the user in a VE, an avatar, is the means for interacting within it and for sensing the world’s attributes (Guye-Vuillème, Capin, Pandzic, Thalmann, & Thalmann, 1998). In a collaborative environment the user’s avatar has, in addition, relevant awareness functions, allowing: to get perception of others, knowing where they are, and visualizing what they are doing or looking at (Capin, Pandzic, Thalmann, & Thalmann, 1997). And the user’s avatar is the channel to display NVC (Johnson & Leight, 2001). In computer science, research related to NVC is typically addressed to create believable human avatars; current approaches are aimed to a number of specific situations like in conversation (Padilha & Carletta, 2003), to express emotions (Fabri, Moore & Hobbs, 2004), or the more sophisticated ones to simulate a teacher or a learning partner (Ieronutti & Chittaro, 2007). But the avatar’s function as a user’s transmitter of NVC has not been much exploited, probably for its complexity and extension. 3D CVEs are a useful media for spatial tasks and for interaction (Park & Kenyon, 1999). Under the assumption that collaborative features and the students’ behaviors related present distinctive NVC cues, our hypothesis is that the observation of the group members’ NVC should allow us to establish indicators of collaborative learning interaction. Our focus will be the collaborative interactions that take place during a task learning situation, where the task to be accomplished is the main cognitive entity, and collaborative interaction will be understood as described by Martínez (2003, p. 51): “…an action that affects or can affect the collaborative process. The main requirement for an action to be considered a possible interaction is that the action itself or its effect can be perceived by at least a member of the group distinct of the one that performed the action”. Our attention, then, will be centered on those behaviors that transmit something about how the group members interact while they are collaborating to achieve a common goal. The main NVC areas related to interaction are Proxemics –the study of interpersonal distance, Kinesics –the study of communicative body motions, and Paralinguistics –the study of voice features others than meaning or content (Ladd, 1996). An especial advantage of this proposal is that the information can be retrieved from the CVE despite of its learning domain, characteristic that makes it appropriate for generic analysis. After a review of NVC behaviors, we believe that, through their observation in 3D CVEs, important learning indicators can be inferred such as: the members’ participation rates; the extent to which the students maintain the focus on the task; the degree of the students making shared grounding; when there is division of labor; and an adequate group process for the task, including the plan, implement and evaluate phases. The NVC cues to be observed during collaborative interaction while a task is accomplished will be described and related to the aforementioned learning indicators. We are aware that probably there will be some missing learning indicators or useful NVC cues, but up to our knowledge, this is the first attempt in this direction. An empirical study to observe NVC cues in a real life collaborative task situation was applied afterwards to the development of a 3D desktop-based CVE. The study and the application will be discussed.